Fantagraphics announced today that is planning to release a complete library of Carl Barks’ stories starting this fall. The hardcover books will contain approximately 240 pages each and will come out twice per year. The retail price will be $24.99. An estimated 30 volumes will be needed to publish all of Barks’ work, making this a 15-year project! All volumes will collect the Duck Man’s work of 6,000 pages in chronological order, but the volumes will not be released in order. 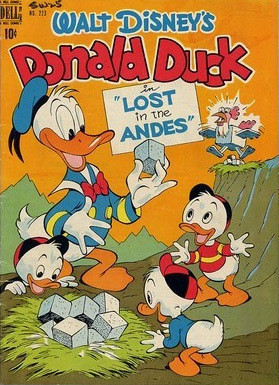 In this interview by Robot 6 the publisher’s co-founder Gary Groth explains that they’ll start with 1948 and that the first volume will be called “Lost in the Andes”, featuring one of Barks’ most popular stories. The second volume to be released will be titled “Poor Old Man”, featuring the first Uncle Scrooge story, and covering the period from 1952 to 1954. This way some of Barks’ best work is available first in the series. Eventually, once they publish all of them, fans will be able to put every book in chronological order on a shelf. 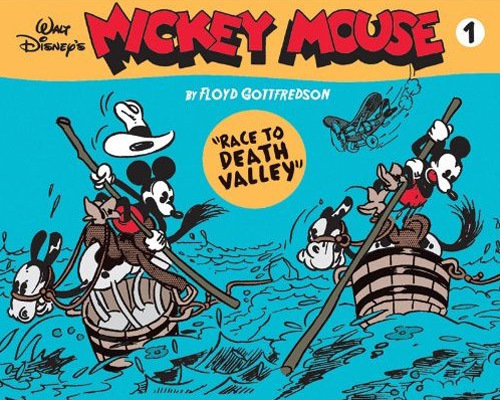 At the Comic-Con last year Fantagraphics announced that it had partnered with Disney to publish a complete collection of Floyd Gottfredson Mickey Mouse comic strips. The first volume of that series is slated for release in May 2011 and can now be pre-ordered on Amazon. Fantagraphics Books is known for other classic comics collections, including The Complete Peanuts, an ambitious 12-year project that reprints every daily and Sunday strip of Charles M. Schulz’s Peanuts. For more information about this exciting new project check out this article at Robot 6. This entry was posted on Monday, January 3rd, 2011 at 12:30 am	and is filed under New Releases, United States. You can follow any responses to this entry through the RSS 2.0 feed. You can leave a response, or trackback from your own site. i can’t wait that long to read them all. Fantagraphics would do better by publishing the collection book a month. As an avid fan of Donald Duck and Uncle Scrooge (Carl Barks only) I read and reread all those stories the way to college and beyond. Over the years I lost most of my original Dell and Gold Key copies & am looking forward to getting a complete collection from Fantagraphics. Yes, why only 2 annually? Make that one per month. As an avid fan of Donald Duck and Uncle Scrooge (Carl Barks only) ever since I was a kid I’ve enjoyed the stories up till now. Sadly the bulk of my original Dell and Gold Key copies have been lost. I eagerly look forward to a complete collection from Fantagraphics. Business is business. If the publishers can make money putting out two volumes a year, that’s good. Putting out one a month would probably break them. I am trusting on medical science helping me live another 30 years — I should be 91 when the final volume is published.